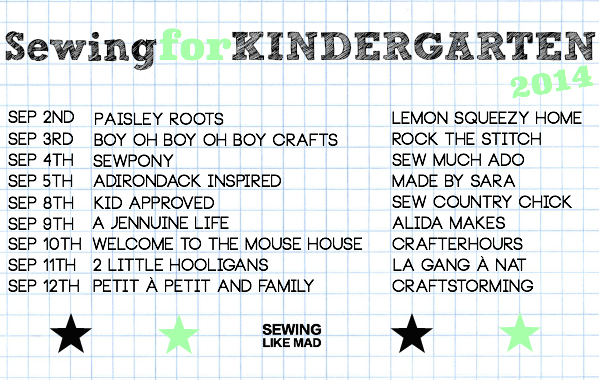 Today I am joining in with Mie from Sewing Like Mad's series, Sewing for kindergarten. Now, a bit on terminology...in Australia, or Victoria at least, kindergarten refers to 'pre-school' - the one to two years prior to school where children attend kindergarten for 3 - 15 hours per week, depending on their age. Children generally start school aged five. So 'kindergarten' in the US relates to the first year of school in Australia which is usually called 'prep' here, although this year they have started a new term for the first year of school (which I don't like) - 'foundation'. Anyway, this year my eldest daugher Isabella started school! In Australia, the school year begins in the final week of January or first week of February - after the six week summer holidays. A logical time to start a school year I think! So Issie has been at school for seven months already...how the time has flown! Now onto the sewing...In the vast majority of schools in Australia (both primary and secondary), children wear a school uniform. Isabella's school sports a very common gingham summer dress for girls and the colour scheme for the uniforms is green and white with a bit of bright yellow (for t-shirts). I actually began this school dress in February when I was like, "I can make Issie a nicer dress than that!" looking at the summer dresses available. Oops, I only finished this dress two days ago!! Thanks Mie for hosting this series to make me finish my unfinished project! The pattern is An from StraightGrain's tinny dress - the skirt is a big longer. I modified the sleeve cuffs to look more like the generic uniform. The perfect pattern for a school uniform! I found the gingham at my local fabric store. My Mum is contributing to this post too!! 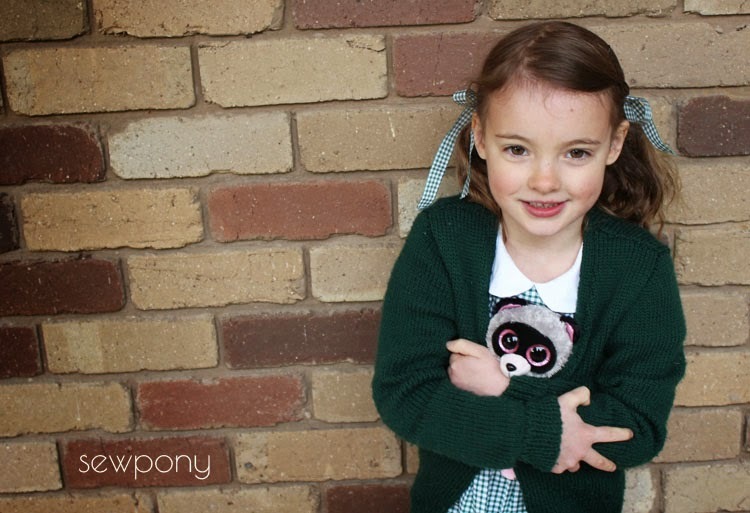 She knitted Isabella's lovely school cardigan which has kept her warm all through winter. Thank you Mum!! Each morning I drive the girls to school and Isabella and Juliette always insist on escorting Issie into the classroom and they love saying hello to all the big girls! 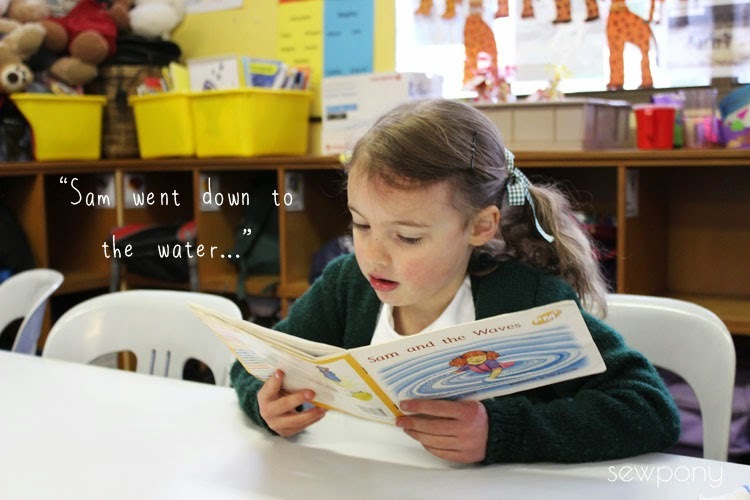 Emily has become a celebrity at Issie's school with her vocal talents and cheeky personality! She loves joining in with the national anthem at assembly on a Monday morning, "golden soil" and "girt by sea" are the only words she knows. Aussie's will know what I mean! Is this your first time sending a child to Kindergarten/ school? Yes! Do you feel like crying or celebrating? I didn't just feel like crying, I cried. I missed Issie for the first couple of weeks!! And what about your child? Isabella cried too. She was a little unsettled for the first week. We moved a few weeks prior, and Isabella had only visited the school once the day before starting. Luckily she made some sweet friends right away and now she loves it! What type of school (public, private, homeschool) does your child attend? Isabella attends the local state school. If is a four minute drive from home and has about 160 children. What was your own first day of school like (if you remember ;-)? I do remember my first day of school, mostly because (as far as my memory tells me), I got a fly stuck up my nose. Yep, that's right!! I had to pick it out!! I was pretty nervous for a the first few weeks of school and I remember telling Mum I had a tummy ache. Luckily I had two big sisters and a big brother at the school already to look after me!! Issie loves school now and she loves learning. She can read simple books and her writing is coming along. She has lots of lovely friends and her teachers are all great. Thanks for having me Mie!! Head over to Mie's blog to see what everyone else is making their kids!! Thanks for telling us how it works in Australia. It is always interesting to hear how it works all around the world. And how insanely cute is Issie in that dress - and the cardigan you Mum has knitted ohhhhhh - one of my favorites colors at the moment. Thank you for all the lovely photos too Suz. You are the best! Thanks everyone for your sweet comments! Marisa - I know what you mean...once Issie decides she knows the words you can't tell her any different! What a lovely dress! So much cuter then our school uniforms here. Yours is so much nicer than the retail dresses. I don't think anyone at school likes the change to "foundation". We still call them "preppies"! The dress is so cute Suz!! And that cardigan is really great! This is so sweet, Suz! I love it! And the cardigan is so nice, too. She looks darling. 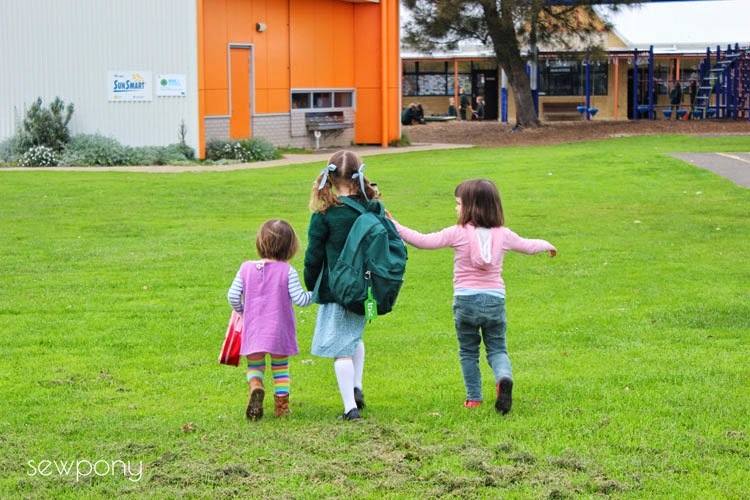 What age do children start kindergarten in Austrailia? Do they have to be 5 by January 1? Here in the US, kids start at age 5, but I think you have to turn 5 before Sept 1. Many families choose, if their child has a summer birthday, to wait until their child is 6 to start kindergarten, especially boys. Missy starts school on Monday, and I know I'll be struggling not to cry. 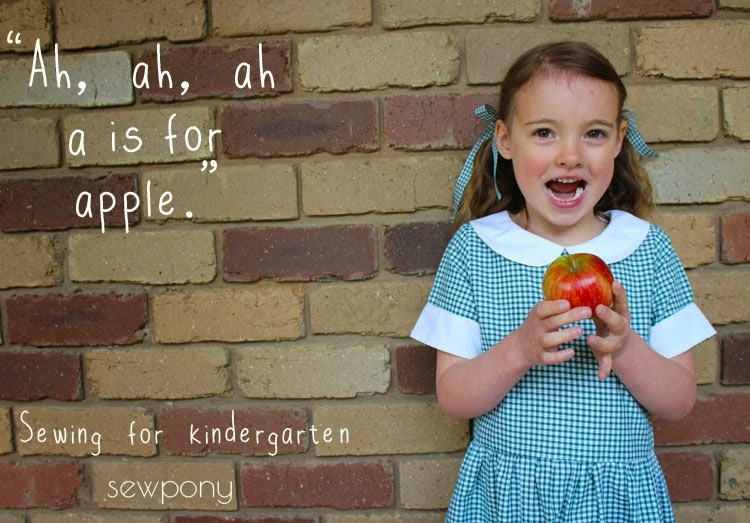 Its hard in a completely different way when your youngest starts school...She's been like your Emily, trotting in after her brother for the last four years, charming her way into school with her cute smile. I know she's going to be fine - it's me that will struggle. She's only 4 and a half. A little too young, but that's how they do things in England. Lovely dress! One of the things I've struggled with is school uniform - its all such cheap, horrible material. 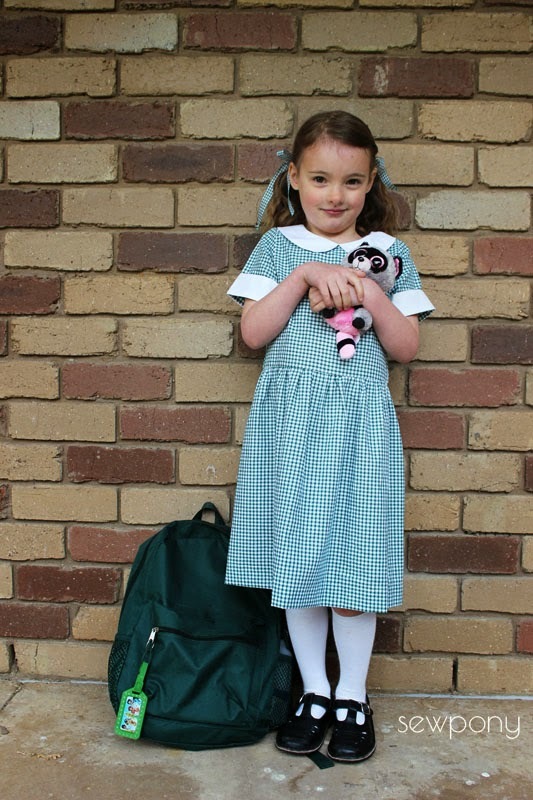 Schools in England wear dresses just like this in the summer - think I'll be making a gingham Tinny too come the spring! Such a good idea! What an interesting post, Suz. I am always curious how educational systems work in different parts of the world. Ukraine doesn't have kindergarten either. I also find it funny that things are opposite in Australia to here. i know it, but I am still always surprised. What? School starts in January? LOL. The dress is adorable! love the vintage vibe, perfect for school. 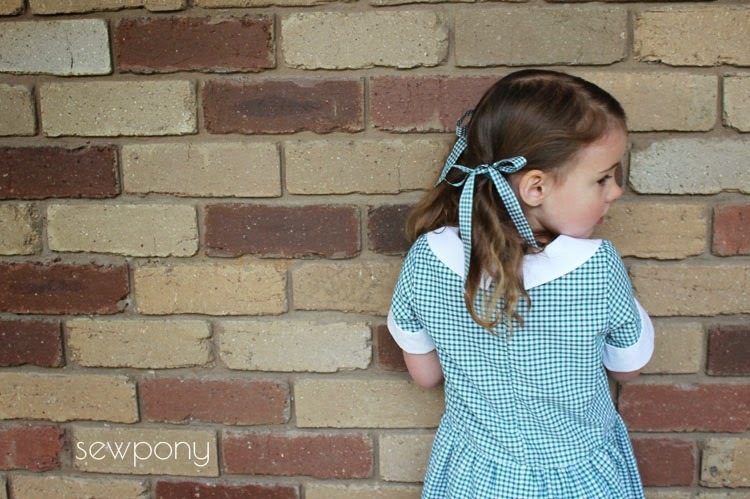 I love the idea of all those cute little Aussie girls wearing green gingham dresses! What a sweet dress and story you shared today. And nice sweater from grandma too!